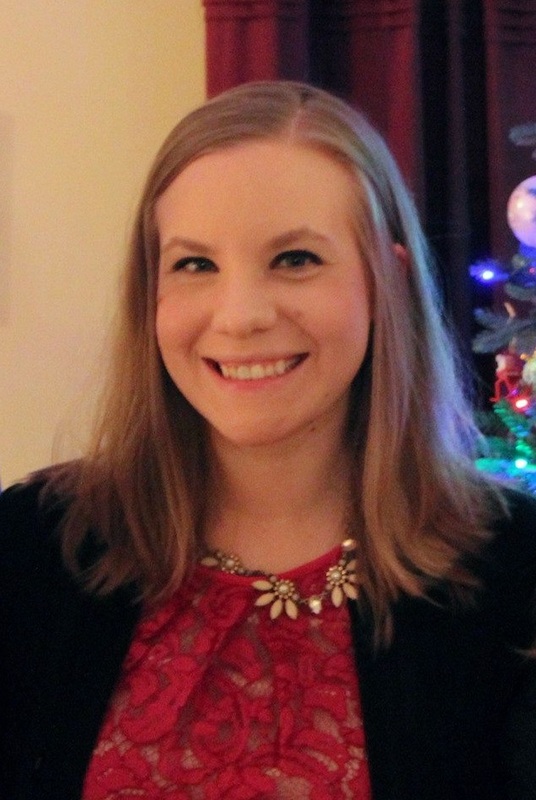 Tomorrow my sister is getting married to her college sweetheart. When they got engaged in February, my mom and I started scheming about what kind of quilt we should make them. We decided to use the Modern Roses line and that we wanted to make a modern looking churn dash quilt. My mom made a few 12 inch blocks and 6 inch blocks and came up with a pattern for a 4 inch churn dash inside of a 12 inch block. She sent the fabric bundle to me and I made the remainder of the blocks -- about thirty 12 inch blocks and twenty four 6 inch blocks. When I was at home for Easter my mom and I laid out the entire quilt and she sewed the top together. My sister has been blessed with a very crafty future mother-in-law who just happens to be an amazing long arm quilter. She happily volunteered to quilt and bind the quilt for us and bring it to the shower back in August. There isn't a full picture of the quilt top to bottom since these were taken at the shower, but you'll hopefully be able to imagine what the rest of it looks like. Here's the happy couple with their quilt! You can hopefully see some of the quilting in this shot. Here's the picture of all of us involved in the quilt -- Lori (my mom), myself, my sister, her soon-to-be husband, and his mom Kay. And -- hooray! -- we'll be getting this made into a pattern for sale soon! 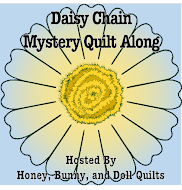 Linking up with Crazy Mom quilts! Park Ranger Husband and I went up to Gettysburg and hiked about 2.5 miles. Go us! We're really trying to get our fitness on. 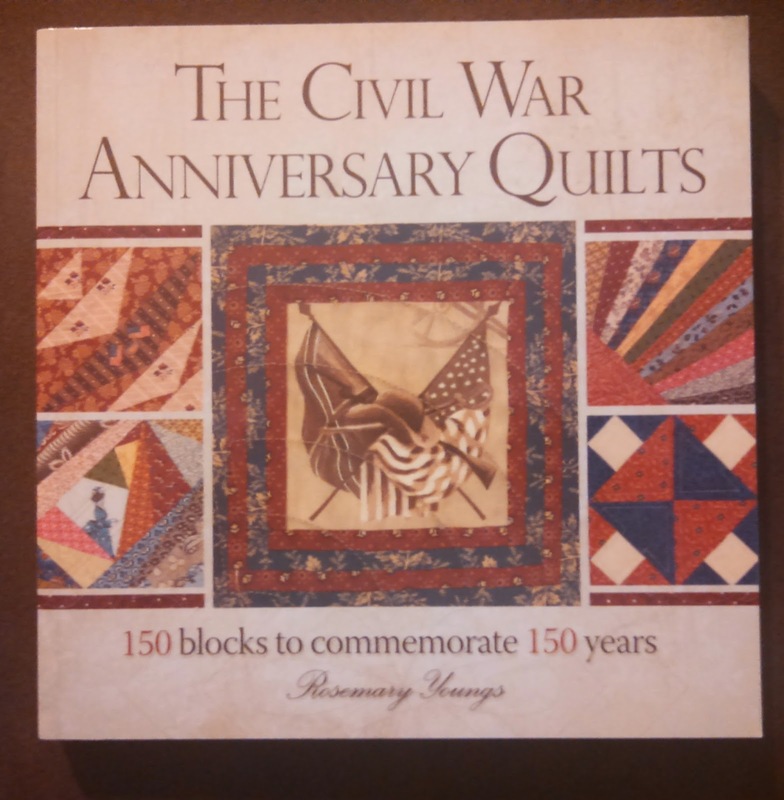 He also bought me a Civil War Quilt book! We also stopped by an AMAZING farm stand on our way home. 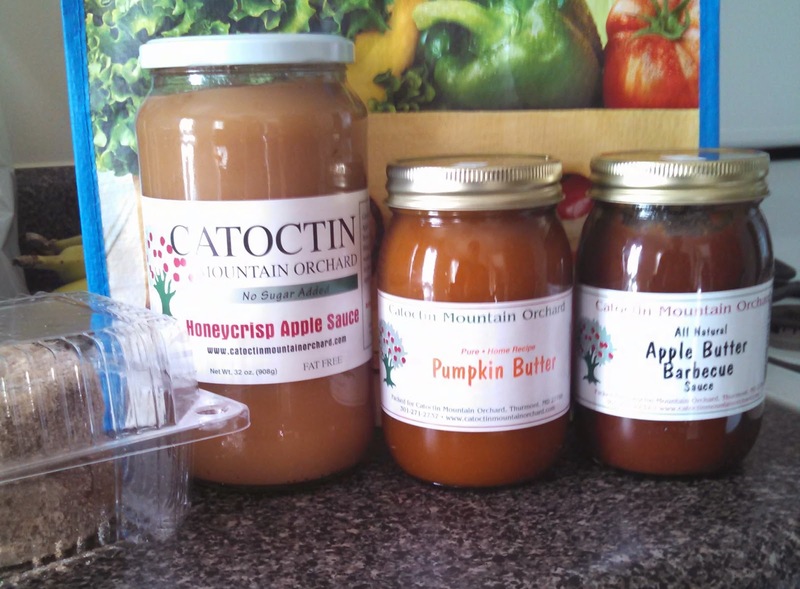 I am most excited about making some stellar ribs with the apple butter BBQ sauce. My scrap stash is still out of control, despite starting making my monthly wall hangings, participating in the Stash Bee and the Sew Pieceful Bee, I still have a pile of fabric just sitting on the floor. Oops. 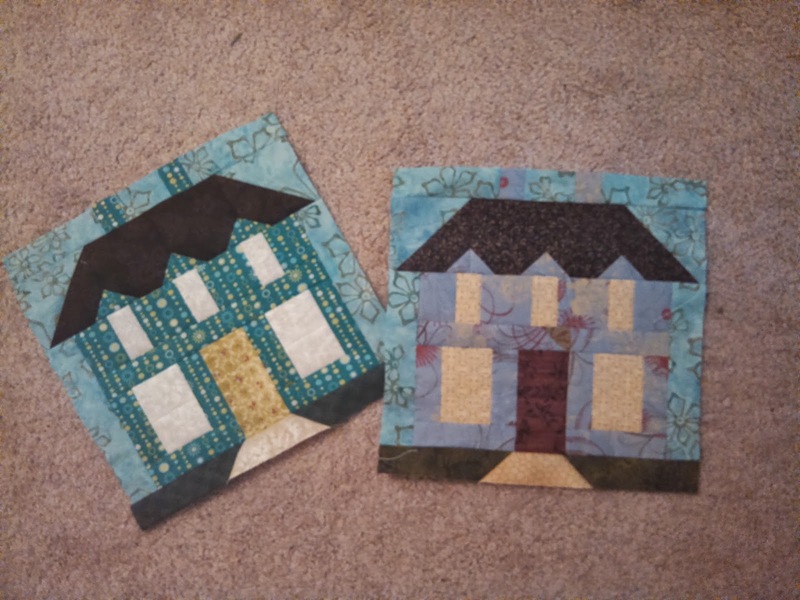 So I started making a few of the Lori Holt house blocks in the most recent issue of Quiltmaker. These are so cute and fun and I am very excited to make more! It'll be a little "dream house" quilt. This month in the Stash Bee Samantha requested that we make any sort of flying geese blocks in olive, chocolate, dark red, and gold. I made an 18 inch block with geese in various sizes. This month for the Sew Pieceful Bee, I made the Variable Star block from the Quilter's Cache. 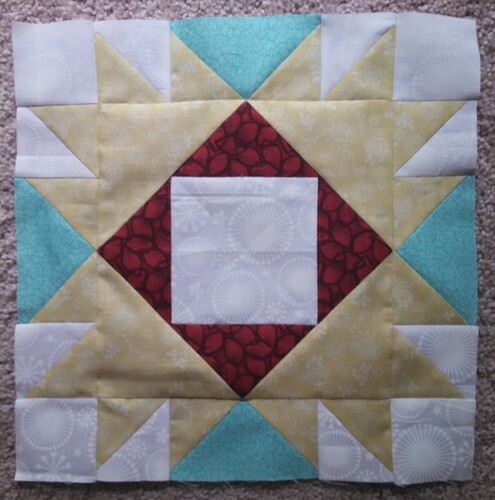 I also made an angel block to make up for someone dropping out last month using the Union Square Variation block. The tutorial doesn't use fast flying geese or quick HSTs and I didn't realize it until after I did all of my cutting -- boo! Nonetheless, the block turned out pretty well. Linked Up Kit Now Available on Etsy! It's been a long time coming but a quilt top kit for Linked Up is now available on the Honey, Bunny, and Doll Etsy page! This quilt is F-U-N! As always the pattern is included with the purchase of a kit! This quilt is also a fantastic scrap buster if you're sitting on piles of scrap! Click here to purchase the pattern on Etsy! And as always, don't forget to use us as your source for extra wide backing! We now have 5 different colors: dark green, chocolate brown, black, tan/cream, and now a beautiful blue! At only $13 or $14 dollars a yard, you can't say no! Quilts at the Fair -- I won a ribbon! Saturday I popped over to the Great Frederick Fair to see the quilts and see if I had won any ribbons. My Stash Bee quilt won Third Place in the Quilts by a Group category! My other two quilts didn't place, but these two categories were the most popular -- Long Arm Quilted by Another and Made by Machine. The other quilts were gorgeous as well! The Mini quilts were so intricate! Although you can't see it well in this picture, this double wedding ring table topper has gorgeous gold machine quilting on it. I think this 1930's star quilt was my favorite. It was pure perfection and fun! I always have a soft spot for pineapple log cabin quilts! I even spotted some gorgeous Kate Spain in the Patchwork Category! And I checked out all the beautiful flowers! I took lots more pictures which you can check out on Instagram! Happy Monday! Another little finish this week -- hooray! I managed to finish another one of my calendar wall hangings for February. The inside of the background is various baby pinks and the outer ring are various hot pinks. I cut out X, O, and heart shapes to decorate the outer ring in reds and burgundies. I actually did all of this satin stitching the same time that I did the finishing satin stitching on my January snowman just so that I could get more done while my settings were just right! I patchwork pieced my large heart together using large pieces of red and pink scraps from my scrap boxes and trimmed it down to size after I ironed on the fusible web. For this one, I had a yard of a red on red tonal leaf print that I used for both the backing and the binding -- with a little to spare! I'll probably end up using it for my September apple -- when I get there! For the FMQ on this one, I challenged myself and used two different filler patterns -- one within the heart, and a different one everywhere else. I used two patterns from the Free Motion Quilting Project -- Heart Paisley in the big heart and Hearts and Spirals elsewhere. Doing the hearts and spirals pattern was great practice for travel stitching which I have not done a lot of in the other things I have FMQ'd. Here's the whole front and back. I used white thread on the front and back. 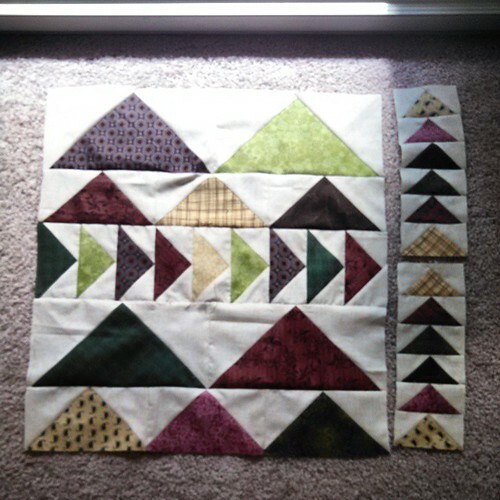 My FMQ is far from perfect but I have made so much progress in 2014 with my FMQ skills! Hooray for me! I also used the red backing for the binding and the hanging pockets and used a decorative stitch to machine bind the wall hanging. I used red thread for this on the front so that it would blend a little bit better, but I still used white on the back since it isn't going to show. Linking up with Crazy Mom Quilts for Finish it up Friday -- two weeks in a row! This is some sort of miracle! 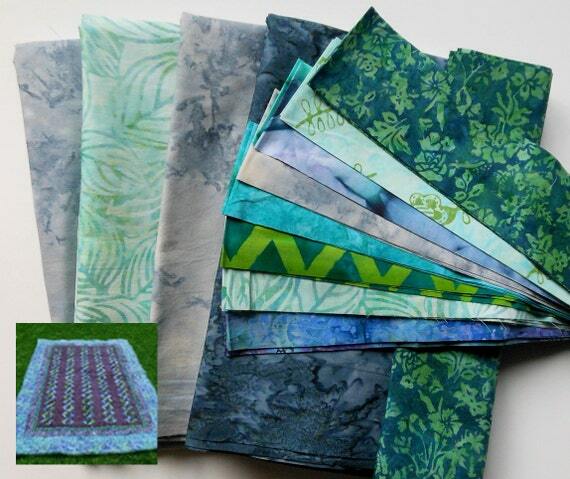 :) Don't forget to sign up for the jelly roll strip swap! I spent this weekend watching football all day both days and finished my January snowman wall hanging! I took some time to whip stitch some of my batting scraps to use for battings for these little wall hangings. Nothing like being resourceful! For the quilting I used Leah Day's Tangle of Lights quilting pattern as my inspiration to quilt this project but I used 6 pointed stars instead of 8 pointed stars. I wasn't able to get the greatest picture of the quilting for this one but hopefully this one will suffice! For the back, I used a half yard of a stashed light blue fabric and a piece of a blue and cream print that I had also used on the front. Since these wall hangings end up about 21 inches wide, a half yard is just a touch too small and so I had to piece this one. Some of the other ones I might use yard pieces, but I will probably piece most of them just to save on fabric. Plus they will be on the wall side, so I'll probably be the only one that sees them! I used the leftover fabric from the backing for the binding as well -- I only had about 4 inches extra binding! Nothing like cutting it close! I still need to add on the buttons for his eyes and on his chest but otherwise he is done being embellished. I didn't add a hanging sleeve, but I used the corner pocket method that lots of people have done tutorials on but a good explanation is here. I'm also looking for some more participants for a 2.5 inch strip swap that I am hosting! Pop over to the Flickr group to sign up! 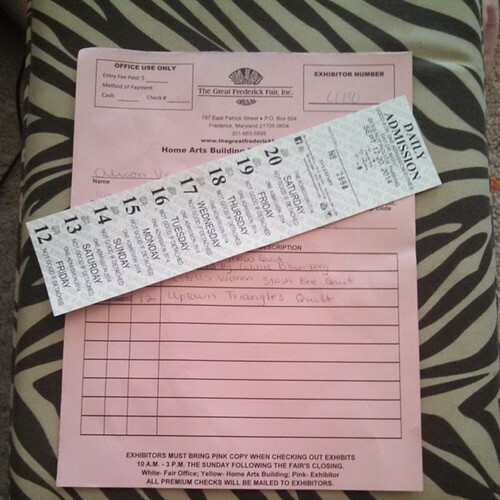 Linking up with Fabric Tuesday, Linky Tuesday, and Free Motion Mavericks! Today I took three of my quilts and entered them in the Great Frederick County Fair to be judged and scrutinized! This is my first time entering my quilts in any sort of contest. I was able to enter up to three different quilts among the 25 quilt categories (yes, 25!) so I decided to just go for it and enter some of my most recent finishes. Park Ranger Husband thought that I should definitely enter his Civil War quilt, but I told him that I couldn't because it hadn't been finished in the last year. He was quite disappointed. The judging takes place next Friday but is closed, so I am not quite sure how/when I will find out the results! Next Saturday the buildings with the quilts will be open to the public, so you bet your life that I am going to be there with bells on when they open! Since the fee for entering items includes a week long pass to the fair, I might be tempted to go every day and get fair food. This is a terrible idea since the following week is my sister's wedding and there will be zero time to alter my bridesmaid dress if I gain five pounds from eating funnel cakes every day for a week. It's finally finished after a long, long time as a WIP! This is an embarassing admission, but this quilt has been sitting at my apartment only needing the binding sewn on since May. Oops. I hand stitched the binding on the back, so it took me quite a few hours of watching The West Wing on Netflix to finish it! This one is going on our bed later today! Pattern: blocks from Tula Pink's Honey Honey pattern, setting designed myself. Linking up with Crazy Mom Quilts for Finish It Up Friday! Wish me luck tomorrow as I am going over to enter quilts in the county fair! Happy Wednesday, everybody! I'm on a major roll with posts this week! Hooray! Today I'm sharing my September BOM blocks for the Fat Quarter Shop Wishes QAL and Quiet Play's Sew Kitschy QAL. This month's block for the Wishes QAL is called Dove in the Window! Working on this quilt always makes me so happy because of the bright colors. This month is the LAST month for this year's Sew Kitschy QAL and I am so sad! I am probably going to have to buy the Sew Retro and Sew Retro 2 Bundles now. Knowing me, if and when I do that, I'll binge paper piece them in one sitting! The last block is Betty in her kitchen! Silly me didn't get a picture of all 9 of my Sew Kitschy blocks together yet! I'll hopefully have that posted soon. Have a lovely September day!